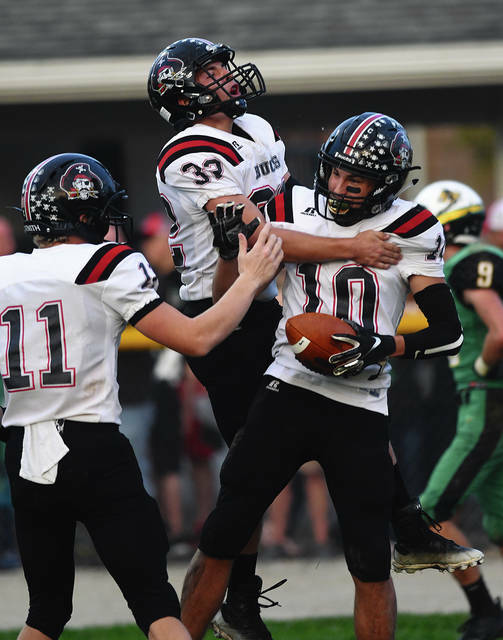 Ben Robinson|GoBuccs.com Covington’s Ty Cates celebrates a touchdown with Cade Schmelzer (11) and Trentin Alexander (32) Friday night. 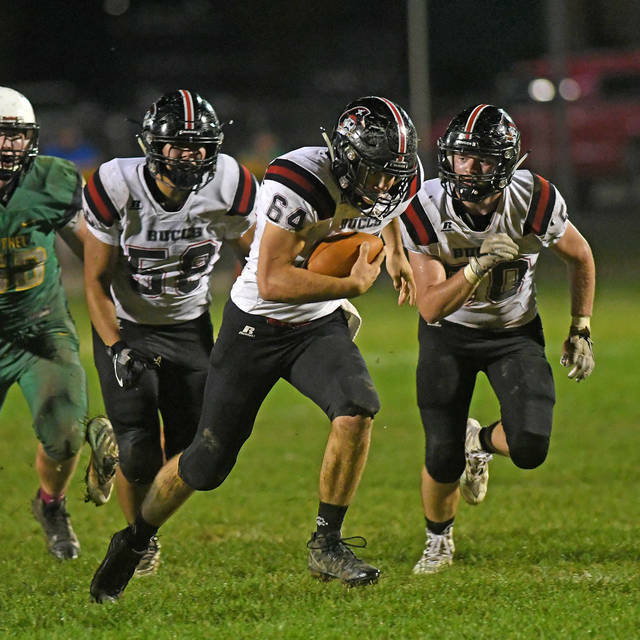 BRANDT — Last season’s 12-7 loss to Bethel on the home field didn’t sit well with the Covington football team and with all but seven players returning from a year ago the Buccs were looking for redemption. Even though that defeat a year ago will never be erased, the Buccaneers did take care of business in dominating fashion en route to a 54-7 win. Maybe the Buccaneers were too hyped up as Bethel quarterback Jacob Ullmer broke loose down the right sideline for a 62-yard scoring run on the third offensive play of the game. The big play was a wakeup call and the Buccaneer defense held Bethel to just 91 yards of total offense the rest of the game. The defense also scored twice in the contest, once on a 75-yard pick-six by Josh Latimer to close out the first half and then a 31-yard return of a fumble by Gavin McReynolds in the waining moments of the third quarter. The Buccaneer offense was a potent as ever as it racked up 402 total yards and scored six times in the contest. And it was a balanced effort across the board as the Buccs used ten backs to combine for 266 yards on the ground and three receiving targets to accumulate 136 yards on six-of-eight passing. As proof, the leading rusher for Covington accumulated 79 yards on just three carries – sophomore Trentin Alexander – and three different backs scored at least one touchdown. And the tone was set by the boys up front on the Buccs’ opening drive after Bethel took its only lead of the contest on the third play of the game. Covington methodically moved the ball into Bethel territory before a penalty forced the Buccs to go to the air on third-and-11 at the Bees’ 29. Cade Schmelzer found Andrew Cates open down the sideline and the junior wideout hauled in the perfect pass to tie the score at 7-7 as Brayden Wiggins’ point-after kick was true. After holding Bethel on the ensuing possession, Covington used a little trickery to hit pay dirt once again as Schmelzer found Parker Dysinger open at the numbers and Dysinger lateraled the ball to Wiggins, who raced the rest of the way to the end zone from 29 yards out and a 14-7 lead. Bethel was able to flip the field on its next passion, but the Buccaneers were not going to be denied as it drove 93 yards to push the advantage to 20-7 midway through the second quarter on an 11-yard run by Wiggins. The Bees were forced to punt once again, but a great bounce left Covington at its own two with just under 2:00 left in the half. The Buccaneers were forced to punt with 34 second left in the half and Bethel elected to try an catch Covington napping in the secondary with a pass attempt. But Jesse Fisher was able to tip the Jacob Ullmer pass and Josh Latimer was in the right place to pull down the interception and race 75-yards the other way for the score and a 27-7 halftime lead. With the ball and the momentum to start the second half, Covington put the game away with a one-yard plunge by Alex Shaffer after Kleyton Maschino was able to pick up a critical first down by scampering 24 yards on a fake punt. Things went from bad to worse for Bethel as Covington scored two more times in the third quarter in the span of 30 seconds as Andrew Cates hauled in a ten-yard pass from Schmelzer and then Gavin McReynolds scooped up a Bethel fumble on the first play of the ensuing possession and raced 31 yards to push the lead to 47-7. With the fourth quarter played entirely under a running clock, Covington used every player on its roster. 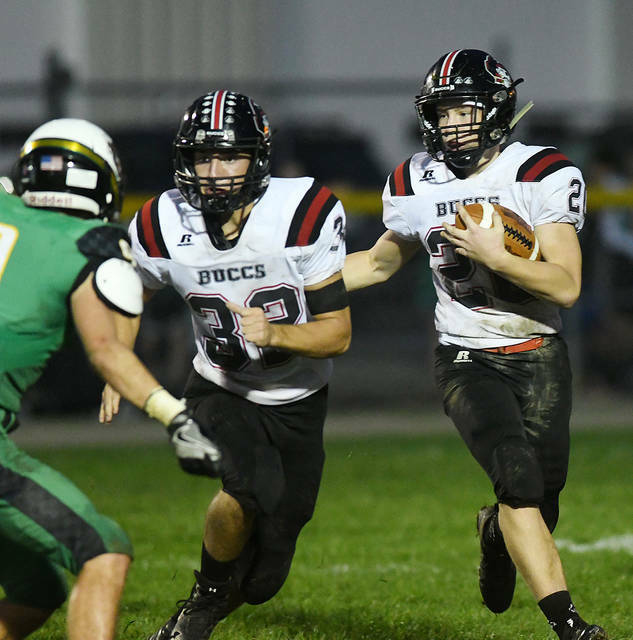 As enjoyable as the evening was for Covington, there were areas Coach Cates will look for improvement as the Buccs head into the final three games of the regular season. The win is the fourth straight for the Buccs as they improve to 4-3 overall and 4-1 in the CCC. Next is a home matchup against neighboring rival Bradford next Friday. https://www.dailycall.com/wp-content/uploads/sites/30/2018/10/web1_andrew-cates.jpgBen Robinson|GoBuccs.com Covington’s Ty Cates celebrates a touchdown with Cade Schmelzer (11) and Trentin Alexander (32) Friday night.